Printer: Roberts Son & Co.
A coat or short jacket had been worn by 17th- and 18th-century gentlemen to provide a warm, protective outer layer when they were riding, fishing and boating. 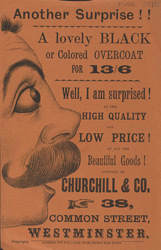 In the 19th century, the overcoat was also worn when gentlemen were outside or travelling. It needed, therefore, to be comfortable as well as warm. Furthermore, it was important that it should be stylish, since clothing was an obvious reflection of social standing. Many different styles of coat were available by the late 19th century. These included the Paletot, a short coat that could be worn as a jacket when indoors; the Inverness, a combined coat and cloak; the Ulster, made of a heavy woollen material and worn with a belt; and, perhaps the most popular, the Chesterfield, worn long to the knee. Overcoats were usually black or grey - muted colours in keeping with the rest of a gentleman's wardrobe.